As you all know we are big fans of RC-Crew chief, it is a great tool to help understand how your car or truck performs on the track. We are going to be running a series of articles written by its creator Bob Wright. You can download a free trial version of the software, and learn how to get the most out of your car when you take it to the track. The goal of this series of articles is to develop your skills to make smart decisions when making setup changes. 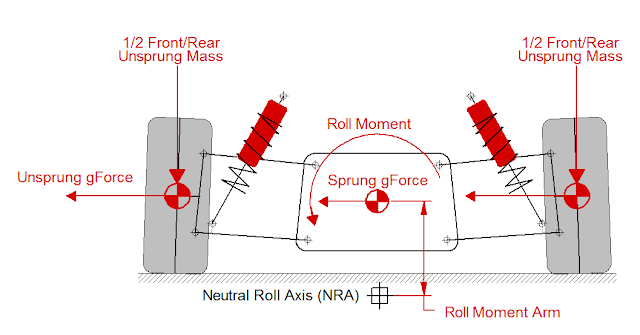 We will be delving into things like Roll Moment, Weight Transfer Balance, Roll Stiffness, Roll Centres, Roll Sensitivity, Camber and Camber Gain and Damping Ratio. Some of these terms may seem strange now but if you stick with this series you will gain a better understanding of the effect setup changes have on each of these properties and what each means to handling. Throughout this series we will be using RC Crew Chief (RC3) to graphically illustrate making setup changes. If you wish to follow along with the demos then you can download RC3 in this link 'Click here'. 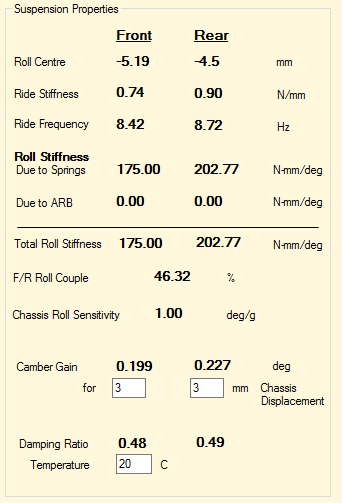 The screenshot on the right shows some the key suspension properties for a 10th scale Touring Car. Get a good grasp on how these numbers relate to your particular chassis and you will be amazed at how quickly and confidently you will be making setup changes. The other goal of this series will be to keep the written word to a minimum so you students don’t nod off in class. I will also try to keep the videos short to stay focused on the goal. So let’s get started with Episode 1 –Setup Physics and Terminology.